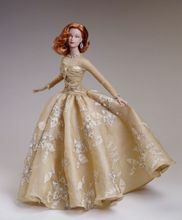 Brenda Starr®, Daphne Dimples® and Betty Ann® are 16” vinyl/ hard plastic dolls with jointed arms and legs, exceptional wardrobes, painted eyes and rooted saran hair. Doll bodies are compatible with Tonner Doll Company's Tyler Wentworth® style bodies and can share clothing. Brenda Starr's wardrobe is resplendent with lush fabrics - wool, silk chiffons, satins and silks - emblished with hand-beading, beautiful tailoring and perfect accessoires.